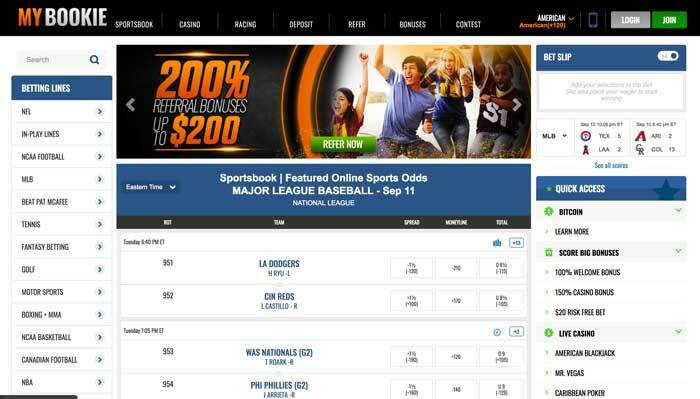 MyBookie first launched itself as an online sportsbook back in 2014. Therefore, while it may not have as much as experience in the industry as some other platforms, it does bring forth a sense of being modern and innovative. Over the proceeding years since its startup, MyBookie has also incorporated numerous other betting options for its members. This includes both a racebook and an online casino. Therefore, bettors can guarantee that there’s plenty to look forward to once signing up to the platform is completed. Something that stands out as being great from the first instance is that MyBookie is able to provide a location for US bettors to register and enjoy what’s on offer. This places it in a small group of US-friendly sites. 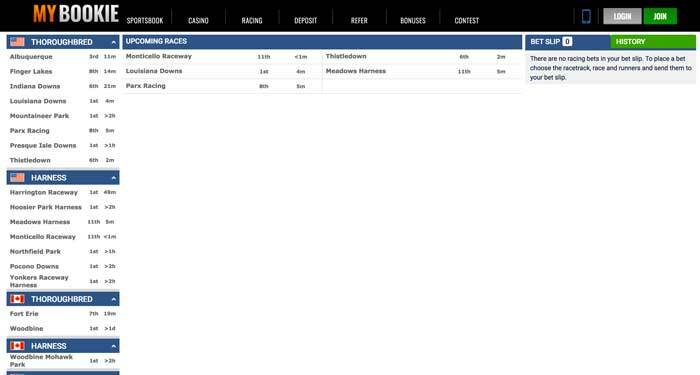 But for all of the locations that can sign up to the betting site, there’s also a select group of locations that cannot. While the join form does allow for locations such as the United Kingdom and Italy to register, it does not hold licenses from these jurisdictions. Therefore, these countries do not provide any regulation for the site to adhere to. Speaking of licensing details, the overall MyBookie platform does have such. It comes from the Curaçao eGaming company. Therefore, while it does have regulations in place, these do not cater to the aforementioned restricted countries. This being the case, if you try to access the site from the UK or anywhere else where it is not permitted, the site won’t show up. The MyBookie website is also accessible from a mobile device. So, if you enjoy playing games while on the move, this site will very much be able to cater to you. You don’t need to download any kind of mobile app to your smartphone or tablet with this site. Instead, you simply need to enter its web address into your device’s browser. This will then allow you to see the mobile version of MyBookie, which has been optimized to cater to the smaller mobile screens. But you’ll still get all of the same high-quality graphics, and all of the sports betting options will remain the same. When you become a member of the MyBookie platform, you’ll also get the chance to claim certain special offers. These cater to you as both a newcomer and a regular player. The welcome offers are what will pertain to you as a new player at the site. In fact, MyBookie has one of these that is available to you as a casino player and two others as a sports bettor. To begin with, you’ll find that there’s a $20 risk-free bet waiting for you. This requires you to complete your registration and then make a deposit. Following this, you need to place your first wager. If this one isn’t a winning bet, then the site refunds your wager by up to $20 as a free bet. 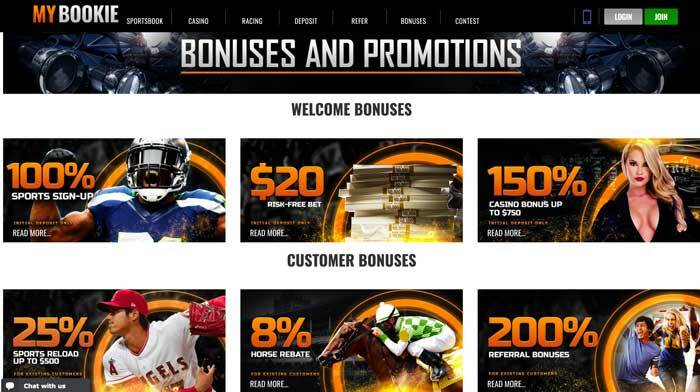 As well as this, there’s the opportunity to claim the 50% welcome bonus for sports bettors. This is also available upon you making your first deposit into your MyBookie account. You need to be making a minimum deposit of $100 to be able to receive this, while anything below this amount will receive a 25% bonus instead. The maximum that you can receive from the 50% welcome offer is $1,000. Simply use the bonus code of MYB50 when making your initial deposit, and the funds will be added to your account. 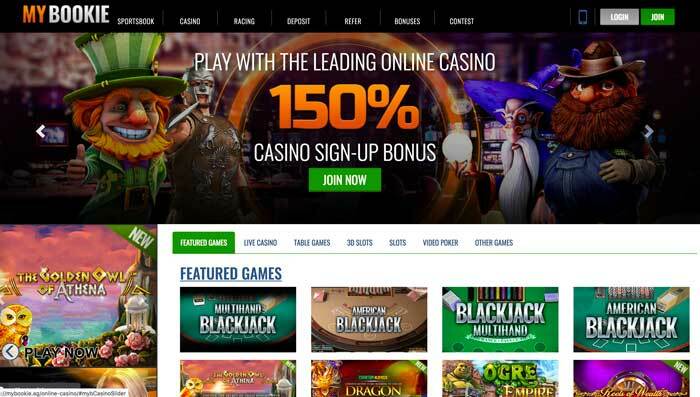 Finally, if you have a preference for playing in the online casino at this site, then you’ll need to claim the casino-specific welcome offer. This requires you to complete your sign-up and then make your first deposit. On top of this, you will be given a 150% bonus by the casino, which has a maximum value to it of $750. For this offer, you simply need to input the bonus code MB150. This bonus will only apply to you if you make an initial deposit of $100 or more, and it comes with a 50 times wagering requirement for you to complete on both the deposit and bonus amount. It’s a bit of a let-down when you arrive at the cashier of the MyBookie platform, as it doesn’t provide you with a huge number of options for depositing with. If you’re a fan of using credit cards, then both Visa and Mastercard products are available for this. You’re able to transfer anywhere between $45 and $1,000 with either of them. Alternatively, you can use a Person to Person transfer, which allows for deposits of between $100 and $500 altogether. It’s great that MyBookie accepts Bitcoin transfers as well. Using this will enable you to deposit up to $10,000. Bank wire transactions are also usable, but you need to be depositing at least $2,000 via this method. ACH transfers are also on hand, but again, you need to be depositing at least $100 with this, although it doesn’t have a maximum deposit amount. Finally, the only other method that you can use is the Phone Transfer option. This gives you the opportunity to deposit between $45 and $1,000. All transactions at this site are done in US dollars, keep in mind. You can request a pay-out from your MyBookie account via the online cashier, or you can contact the customer service department with the toll-free number (if you live in the United States). Withdrawals will only be processed from Monday to Friday, and this will usually occur within 48 hours. It generally depends upon the payment method that is being used for the withdrawal as to how long it takes after this. Withdrawals can take anywhere between a few hours to a few days to fully complete. Unfortunately, the four withdrawal methods that you can use – bank wire transfer, Bitcoin, MoneyGram, and ACH – all have fees that you need to pay, too. This rate will differ depending upon how much you’re opting to withdraw from MyBookie. But the highest amount that you will need to pay stands at $50 for a bank wire transfer. Should You Play at MyBookie.ag? Naturally, if you’re a US-based player with fewer options than many other countries, the MyBookie platform is somewhat more appealing. It has both sportsbook and casino options on hand for you to enjoy, meaning that you will find lots to participate in at the site. The welcome offers for these two sections are also quite appealing, although they do have high wagering requirements to complete. The casino welcome offer is almost impossible to reach with 50 times both the deposit and bonus needing to be wagered before you can make a withdrawal. The selection of sports and casino options that are on hand do make for a good part of the site, though. Furthermore, MyBookie is restricted to quite a big range of countries, with some big markets like the United Kingdom not being able to participate in betting there. Plus, with so few payment methods to choose from, it’s not as diverse as one would hope. However, it does accept deposits via Bitcoin, which gives it more of a modern edge. Not only that, but you’re able to access everything that it has to offer via a mobile device. This means that you can place bets while out of the house. Overall, MyBookie does have some appealing features – it’s just that some of the negatives do stand out a bit too much in places.